Brussels Sprouts, Rosenkohl, chou de Bruxelles… Those names arouse deep feelings of aversion in many people. Often it’s due to a traumatic experience in childhood, when one HAD to eat at least three of those little cabbages to be allowed to leave the table. This fight sometimes took hours and cost tears and wrecked everybody’s nerves. Most cabbage varieties contain some hot or bitter tasting substances which help the plant to scare away predators. And they do. Especially little children. That’s sad because cabbage really can taste delicious! I swear, if we started to eat cabbage later on in life we probably wouldn’t have a problem with it at all. Maybe politicians should think about a legal age. 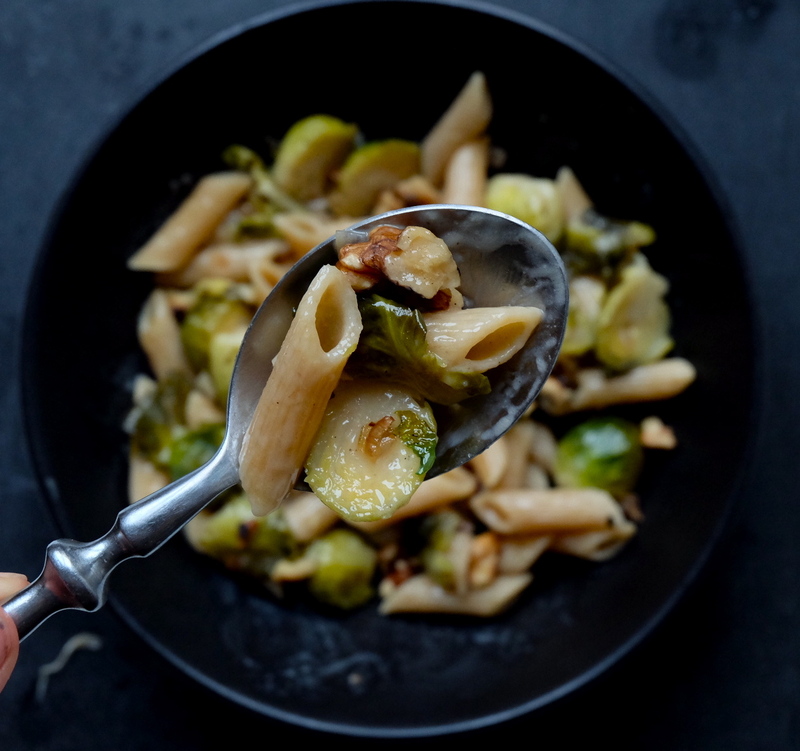 Anyway, for all of us who have overcome their bad feelings, here is a recipe for a hearty bowl of pasta with Brussels sprouts and a creamy sauce. It’s comfort food, it’s power food and really good on a cold afternoon. I took wholemeal pasta, which of course isn’t necessary but goes really well with it. Heat water for the pasta. Roast the walnuts. Chop the very ends off the sprouts and blanch in little water about 5 minutes. Drain. Boil the pasta. Heat a splash of olive oil in a frying pan and add the chopped onions, fry on low heat and add the garlic (I tend to half the clove and take it out later, just for a subtle garlic hint). Meanwhile cut the Brussels sprouts in halves or even quarters, depending on the size. Also add to the frying pan and fry for a short time while stirring vigorously. Pour the white vinegar over it, increase the heat and let it boil away almost completely. Add the oat cream and let it simmer until it has thickened a bit. Grate some nutmeg over it, season with salt and pepper and let the sauce thicken to your favourite consistency. Mix in the cooked pasta and stir until every noodle is coated with sauce. Sprinkle with roasted nuts. Dig in! Note: This dish is good for reheating the pasta without it becoming dry. Brussels Sprouts, Rosenkohl, chou de Bruxelles… Diese Namen rufen in vielen Leuten große Abneigung hervor. Oft hängt das mit einer traumatischen Kindheitserfahrung zusammen, wenn man mindesten drei kleine Kohlköpfe essen MUSSTE bevor man den Tisch verlassen durfte. Dieser Kampf dauerte manchmal Stunden und kostete alle Beteiligten die Nerven. Wie dem auch sei, für alle, die ihr Kindheitstrauma überwinden konnten, kommt hier ein Rezept für ein herzhafte Schüssel Pasta mit Rosenkohl und einer cremigen Soße. Dieses Rezept zum Seele verwöhnen und Energie tanken und schmeckt besonders gut an einem kalten Nachmittag. Ich habe Vollkornpasta verwendet, was natürlich kein Muss ist, aber supergut passt. Wasser für die Nudeln aufsetzen. Die Zwiebeln und den Knoblauch in feine Stücke schneiden (manchmal halbiere ich den Knoblauch nur, um ihn wieder herausfischen zu können: so bekommt das Gericht nur eine leichte Knoblauchnote…) Die Walnüsse rösten. Den Rosenkohl putzen, in wenig Wasser ca. 5 Minuten blanchieren und abgießen. Die Nudeln kochen. Die Zwiebeln und den Knoblauch in ein wenig Öl glasig dünsten. In der Zwischenzeit den Rosenkohl halbieren. Dann zu den Zwiebeln geben und unter Rühren kurz mitbraten. Den Essig hinzufügen und fast ganz verkochen lassen. Die Hafer Cuisine hinzufügen und ein wenig eindicken lassen. Etwas geriebene Muskatnuss, Salz und Pfeffer hinzugeben und die Soße bis zur gewünschten Konsistenz einkochen lassen. Mit der gekochten Pasta mischen, bis jede Nudel mit Soße bedeckt ist. Mit den gerösteten Nüssen bestreuen und genießen! Notiz: Dieses Gericht ist super für übrig gebliebene Pasta, die man so gut erwärmen kann, ohne dass sie austrocknet. your pictures are beautiful! And love the idea of the pasta…i really prefer “unusual” pasta recipes not only just the sauces..even tho im not a huge fan of the sprouts it does look delicious!